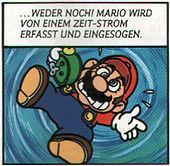 Super Mario: Verloren in der Zeit (English translation: Super Mario: Lost in Time) is the name of a 16-page comic in four parts, the first one being published in the 5/1993 issue of the German Club Nintendo magazine, the others in the following issues. Mario being grabbed by a time slip. Mario meets Joe & Mac in part 1. The comic begins with Mario getting a package by his mailman. He finds an Alarm Clock inside, donated to him by his most loyal fan, as the note inside reads. However, it turns out that the mailman was Dr. Wily, Mega Man's main antagonist, who plans to rule over the whole city. Unsuspectingly, Mario tries to set the alarm but immediately is gripped by a time slip, making him land right on the back of a dinosaur. He doesn't believe his eyes and drops his Alarm Clock. When the dinosaur disappears, Mario spots two cave men, Joe and Mac. He tries to make his confusion known to them, but they don't understand him and instead smack his head with their mace. This causes Mario to break the fourth wall and ask the illustrator why he is so flat in appearance. After this encounter, Mario is hungry and enters DinoBurgers, a stone-age fast food restaurant. Asking for a "huge burger", he is given the Tyrannoburger. Instead of asking for money, the salesclerk just takes his cap in exchange. Outside, and obviously fatter in appearance, Mario meets a Yoshi wearing a hat which reads "Taxi". The Yoshi offers his services to him but Mario declines. Instead he leaves all his clothes in a shop and buys a cave man outfit made of coat. Soon after he spots some cave women running right towards him. Mario, thinking they were zealous of his new outfit, is glad to see them. However, it turns out that the girls were fleeing from a Tyrannosaurus rex which now is about to attack Mario. Luckily for him, he spots a Fire Flower nearby and eats it. Turned into Fire Mario, he throws Fireballs at the dinosaur that falls to the ground and spits out Mario's Alarm Clock. Thinking that the Clock will bring him back to the future, he tries to set it again. This part of the comic introduces a second illustrator. In it, Mario is teleported into the Viking age. His Alarm Clock falls right at the feet of three Vikings named Erik, Baleog, and Olaf who, not knowing how to use it, unintentionally activate its effect. They are teleported into the present-day New York City. Mario, in the meantime, flees from the Vikings' wives, who are angry with the plumber, considering him responsible for the disappearance of their husbands. In New York, the Vikings are highly confused about all the cars, and the inhabitants are very scared of the strangers, even resulting in some cars crashing. Some policemen think the Vikings are holding an illegal demonstration and arrest them. Meanwhile, Mario was forced by the Viking women to work for them, he can be seen doing the dishes, chopping wood, and looking after their children. At the same time, the Vikings are told by a judge that their Alarm Clock would get confiscated. Knowing that the Clock is responsible for their time travel, however, they grab and activate it. Meanwhile, another Viking tribe is attacking the village where Mario is working. The plumber gets the idea to use a Super Mushroom. He grows to an enormous size and thus defeats the men. He gets celebrated for it by the Viking women, but in this moment, their husbands are returning. Angry at Mario, they throw the Alarm Clock at his head. Trying to finally return to the future, he activates the Clock again. Hösn having the idea to use the Alarm Clock as a trophy. The third part of the comic shows a planet called Hösndösn, with two aliens called Hösn and Dösn talking to each other. They are arguing about the upcoming "intergalactical Olympics" and about the lack of a trophy for the winner. In this moment, Mario's Alarm Clock is landing on the planet, right in front of them. Hösn has the idea to use this Clock as the trophy. Soon afterwards, Mario is appearing on the planet as well, almost crashing with another alien. He searches his time machine and finds it in Hösn's hand; however, Hösn is not prepared to give his "trophy" away. The third alien, introducing himself as Klösn, claims that the only possibility for Mario to get the Alarm Clock back is to take part in the Olympic Games. Mario is not enthusiastic about this matter, but he does take part. His strongest competitor in the games is Plok, a character from a video game of the same name, and some characters from the Star Fox series (namely Peppy Hare, Falco Lombardi, and Fox McCloud) can be seen in the audience. While Mario is skiing and skating and breaking several Olympic records, he is encouraged by Klösn, who seemingly wants to see Mario win his "trophy" back. Mario and Plok are the two strongest sportsmen. When Mario is about to lose the last match in the Olympics, he says that he needs to "push the Y button" in order to win, referencing his game franchise, and he ends up victorious. He grabs his prize and gets kissed by some girls who are very enthusiastic about his victory. Unintentionally, Mario activates the time machine again. Mario falling from the sky. 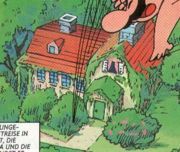 Mario, still wearing his cave man suit, falls from the sky, right in front of his house, which is located on Pilzgasse 13 (which translates to "Mushroom Alley 13"). He enters through the door, looking forward to seeing Luigi, Yoshi, and Toadstool inside. However, there is a mess in his living-room, with things lying all over the ground and Yoshi, wearing sunglasses, a gold necklace and a red vest, relaxing on a stool. Mario, suspecting that the Alarm Clock has taken him to the wrong time again, grabs a newspaper and reads something about a bandit being awarded with a medal of honor. Turning on the TV, which shows the game show Wheel of Fortune having turned to Wheel of Misfortune, supports Mario's fear that the mailman in fact was Dr. Wily. He runs out of the house in order to stop Wily's plans. A falling cactus narrowly misses him. It turns out that the cactus was dropped by Miss Steinbrunnen, a neighbor of Mario's who obviously turned into an evil witch. Dr. Wily, Mario and the strange Princess Toadstool. In order to get into Dr. Wily's fortress, Mario masquerades as Wario, after asking the salesman to give him the most evil clothing he has to offer. He indeed manages to pass the guards with the help of his mask. Inside the castle, he takes off the mask and spots Princess Toadstool. Not only she looks different from her normal appearance, wearing a black dress, she also calls the guards to arrest Mario. Dr. Wily and Toadstool tie him to a special machine, obviously in order to manipulate him as well. In this moment, however, the Alarm Clock (which is located in the same room, for reasons unknown) is ringing and exploding. Mario wakes up. As it turns out, it was only a bad nightmare. Mario smashes his real alarm clock with a Hammer, being watched by Luigi and Yoshi who are surprised at Mario's strange behavior. According to this comic, Mario's favorite TV show is Wheel of Fortune. This page was last edited on April 22, 2019, at 00:33.